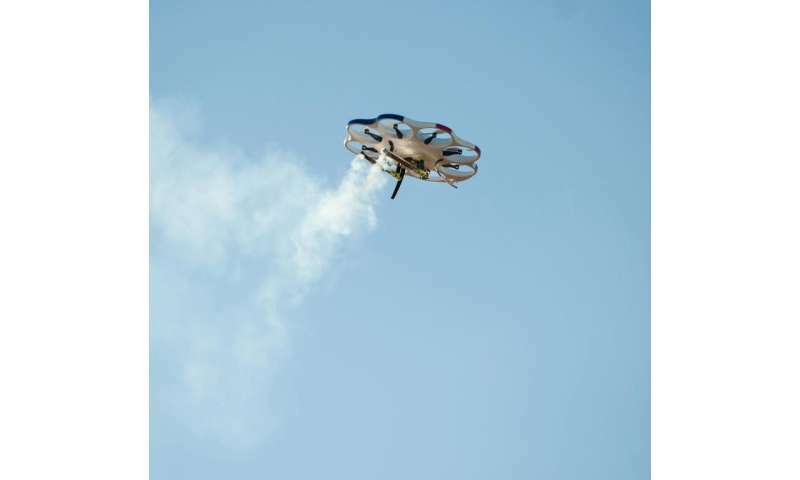 Cloud seeding flare tests were deployed from Drone America's DAx8 UAS aircraft flown in Reno in early February. As the first phase in a new industry-academic research partnership between the Desert Research Institute (DRI), Drone America, and AviSight, the test flight of a DAx8 multi-rotor aircraft with attached cloud seeding cargo validates the potential for UAS to significantly enhance airborne seeding operations, explained Adam Watts, Ph.D, the project's lead and an assistant research professor at DRI. "This is a major milestone," said Watts. "Utilizing our state's FAA test site designation, we were able to fly this advanced aircraft right here in Northern Nevada and verify that UAS are fully capable of carrying active cloud seeding payloads." The DAx8 is a robust multi-rotor aircraft for commercial and industrial applications. The unique eight-rotor design allows for the DAx8 to carry large payloads, while the advanced software and GPS guidance provide the aircraft with self-stabilizing capability and multi-waypoint navigation. "We are extremely excited to have completed yet another step in reaching our goal of autonomous cloud seeding application," said Mike Richards, President and CEO of Drone America. "Our joint research program with DRI is well on its way to revolutionizing the cloud seeding industry by providing safe airborne seeding with significant potential of providing relief to people in drought-stricken areas." The next phase of the project will be to conduct flight planning and test airborne flare deployment with Drone America's Savant fixed-wing aircraft, said Watts. Using a multirotor in this type of application is crazy. An autonomous plane would be a much better choice. While I fly both, I prefer multirotors, however, a plane would be able to fly for much longer, cover a greater area and carry a larger payload.